Paris attacks investigation: Raids in France, Belgium, manhunt, Syria passport questions. 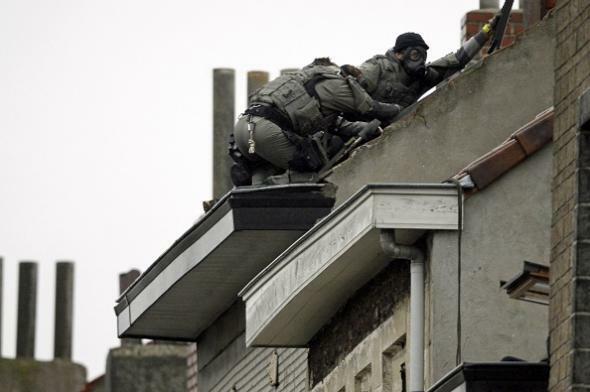 Special forces officers outside a home in the Brussels suburb of Molenbeek on Nov. 16, 2015. One of the men who attacked Paris held an emergency passport or similar document, according to an unnamed French senator who was briefed by the French Ministry of the Interior. The senator told CNN the bomber falsely declared himself to be a Syrian named Ahmad al Muhammad, born on September 10, 1990, and was allowed to enter Greece on October 3. From there he moved to Macedonia, then Serbia and Croatia, where he registered in the Opatovac refugee camp, the lawmaker said. Eventually, he made his way to Paris. Despite the word “falsely” in that paragraph, it’s not in fact clear if the holder of the passport was using a fake name or where he came from before arriving in Greece. Authorities have sketched out the possibility of a larger network linked to the Islamic State that could involve as many as 20 plotters with links stretching to war-ravaged Syria … French Prime Minister [Manuel] Valls said the attack was “organized, conceived and planned” from Syria, where a nearly five-year-old civil war is raging. Waves of migrants fleeing the civil war have fled to Europe, raising worries that militants could also have used the exodus as way into the continent. The Post writes that “as many as 20 people in Europe” are suspected of having been involved in planning Friday’s events, and a number of those individuals appear to have been based in Brussels, specifically in the suburb of Molenbeek. The New York Times, meanwhile, reports that Salah Abdeslam—the suspected eighth attacker—was actually stopped by French police Saturday morning but released because “his papers appeared to be in order” and he apparently not yet been identified as a suspect. Abdeslam’s 31-year-old brother, Brahim, is believed to have blown himself up on Friday at a café.